The baseboards and trim in the dining room have been painted white. The windows have been primed and painted, but are awaiting a second coat. The built-in hutch however, has only been partially primed. I left the beadboard backing untouched because I thought it might be a nice contrast to the white (and nice to maintain just a touch of the original wood). I like it, and I think I’ll leave it, but what about the shelves? Do you think they should go white or stay natural? I can’t quite decide, and I would love to finish painting soon. I think the shelves should be white. It will help draw the eye to the items on the shelves, I think. I think the shelves should be white as well, for contrast and pop. Gorgeous design, as always! I would definitely paint them white. Right now they just look forgotten rather than intentional. I can’t wait to see the whole room! I would say white shelves. I do love that wallpaper! I, on the other hand, think that you should even paint the back. Maybe another color? Like gray or something compimentary to the colors of your dining room. The shelves too, of course. I agree with Calliope. 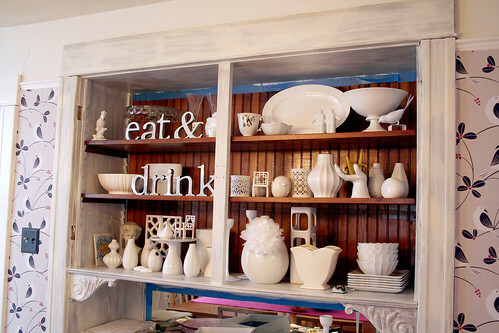 Paint the wood and shelves another color so your white objects pop. completely agree with this. Can’t wait to see it finished. I don’t like the wood, I would paint all of it white or something just a few shades darker to make the white dishes pop. I agree with this completely! Gray in the back would look lovely. My personal take is that while the natural wood might pop against the white, it just looks unfinished … the gray would keep some contrast and highlight the wallpaper. Yes, and I would use the same gray on the ceiling above the molding. BUT, if you just want to choose between white or wood, I would leave them as is, and here is why. If you paint them white, I think it will take away from your beautiful white display. Leaving the shelves to blend in with the back makes your display items pop more. This is just my humble and untrained opinion, of course! Have fun! I couldn’t agree more … but I was wondering about the deep rose accent color in the wall paper? I thing that would provide the most/best contrast between not only the newly painted trime (which blends with the wall paper a bit) but also the white ceramics on display. We know you’re not afraid of pink … so go for it! It looks great! I would paint the shelves so they match the bottom shelf. I woud definitely paint the shelves (as well as the beadboard) white for a chic monochromatic look. I say paint it white. I think you should paint them white too. painted white. to match the bottom shelf and the vertical piece. Looks good! It is nice to read about someone who is enjoying their DIY project. I’m stuck in a nightmare of one. Hating it more and more every day. i would paint the shelves white, but paint the backboard a darker color to make the white objects pop! paint the shelves white, paint the beadboard in a darkish color from the wallpaper (a pink, perhaps?) that way it will look cohesive and the dishes will stand out! Paint them! And I agree about painting the beadboard another color as well. I definitely suggest painting the shelves white. Personally I’d paint the beadboard backing white as well for a clean look, but the natural wood might make a nice contrast. I definitely think you should paint the shelves and leave the back untouched. It’s looking good already! The wallpaper looks even cuter with the new trim color. I would paint the shelves white as well, and I would paint the bead board a contrasting color, maybe turquoise or grey… Lookin’ good! Oh, white definitely. I love the natural wood backing, and all white will help set it off even more. I hate to say it, but I’m with a PP; I think you should paint the back as well. It looks forgotten to me, even if you painted the shelves white. I tend to want white shelves and a contrast back, but a painted back. One of the wallpaper colors would make it look really polished… Just my opinion though! Agreed. Paint the shelves white and then paint the bead board a contrasting color. Black would be pretty rockin’! I was thinking black too. Or super dark charcoal. I agree with others: paint the shelves white. I vote for white shelves! I vote for all white also. I would paint it all white! I love that you’re painting the trim white, and I agree that the beadboard and shelves would look great painted. I’m going to jump on with a few others though, and say that if you’re displaying white pieces, paint the back and shelves something contrasting to make the white pop. I think they’d get lost on white shelves. Maybe grey or a soft pink to go with the wallpaper? I am kinda digging what you have going on right now! I vote paint the whole thing white! I agree with just about everyone else – I think the shelves should be painted too. They look like they were forgotten instead of being left unpainted intentionally. I think they should be a light grey (like in the wallpaper) though instead of white so that all of the objects on them stand out a bit more instead of getting lost in a sea of white. And if you decide to paint the beadboard in behind, I’d paint them a similar light grey as well to add a little extra visual interest without taking away from the artful collection you’re displaying. i’m odd one out, i like the shelves the natural wood. They blend into the beadboard backdrop and visually disappear. Leaving the lovelies on shelves visually floating. Which is an interesting look. But, the final decision as always is yours and i’m sure it’ll look great whichever you decide to go with! I think stick with natural. I think painting them white will make the objects appear to float. The shelves plus backing in natural wood looks very ‘grounding’…for lack of a better word. I think you should paint the shelfs and the beadboard too. I know that’s probably not what you wanted to hear. I vote for painting the shelves white. I think the shelves should be white, especially with the bottom shelf already painted. But the backboard could be painted– like a blue or a red to go with your wallpaper! The plates would contrast nicely. Guess I am in the minority, but I like the shelves kept the way they are now if the beadboard is staying natural. definitely white!! and i think the back should be painted white as well. I’d paint the shelves white and I’d paint the beadboard a color. Not crazy about the wood after all your painting. Love the white! White shelves! But, I disagree with everyone’s vote for a white beadboard. All your beautiful objets would just disappear! Leave it the original stained wood and use paper to cover it if you want to change up the background, but preserve the original look of wood! Paint the shelving white and paint the bead board something darker. I think the wood tone looks out of place now. It would look great a dark grey or even black. Your collection of white objects will look wonderful. Yes, this. Grey on the beadboard will look great! What if you left the shelves but added either gold or silver leaf to the front edge (really the only part showing)? A little bling/light catcher for fun. I am of the camp…white shelves with the beadboard backing painted a complimentary color to the wallpaper. It will make your display items “pop.” Do it. I agree with painting the shelves white and I would also paint the back. Maybe a color other than white? i would personally paint them white. I think white for both or maybe an accent color for the beadboard. Looks great so far. I’m planning a similar project here, trying to wake up our home with some white trim. Can’t wait to see how it turns out! I like the idea of the hutch trim and shelves white but the backboard as natural wood. Yay for painting progress! I vote you paint the shelves too. I do like the contrast in the back. The wood is lovely, but what about pulling a color from your wallpaper? The blue or pink? That would be fresh too. Great project! I was wondering if any one else would think pink. While I’m not a pinkie, I know you are. Even a greyed shade of pink would work. I never noticed the details of the hutch until you painted it white. Great way to wake up the dining room! Definitely paint the shelves white. The bead board would look hot painted a saturated color inspired from your wall covering. The high contrast will really make your white dishware pop! Loving the painted trim! I would definitely paint the shelves, that way, the wood on the back draws the eye in! I think a colour, like turquoise or grey, would be nice! Definitely paint the shelves white so they match the bottom shelf. I am also in agreement with the others. The back would look great if painted in a contrasting color. Definitely paint the shelves white! I don’t absolutely dislike keeping the beadboard in the wood tone but think it may look crisper painted an accent color. I vote white. It’ll look more intentional. My vote is white. And I agree with the other people putting their two cents in that you should paint the back gray or something like that. I think you should leave the shelves as-is, but paint the edges facing into the room (does that make sense?) white. Looks terrific so far! Another vote for painting them white! With the bottom shelf white, it’ll look more solidified with the remainder of the shelves white. What about making a fabric back for the shelves? You could cut a custom piece of foamcore and upholster it with a fun pattern, then pop in in place (maybe secure it with 3m contact strips). Then, if you get tired of it, you can change out the fabric, etc. It’s less permanent than painting the back too! Of course, it’ll only work if the shelves are removable. I would definitely paint the shelves white. I would say to also paint the back white or paint it some other color that would complement the rest of the dining room. Maybe a nice gray? Or pale pink? Paint it all- even the beadboard. I think it looks weird with the brown back. Either I’m really old-fashioned . . . or just old. I think it all looked better before with the completely natural finish. The way it looks now appears, at least to me, that you just primed the trim for paint and blends in with the wall/paper as opposed to popping out. I think if you want to go white, then really paint it white . . . without the wood tones showing through. I do think that it would look nice with the black in the back . . . or black all around to make it more dramatic. With all that said, I think you are amazingly talented and I don’t know how you have the energy for this right now. Also, I hope you’re looking into getting an agent if you don’t already have one because I see the potential for an HGTV show for you . . . seriously. I’m pretty sure the wood tones showing through on the hutch are there because it’s only primed, not painted yet. In the left edge of the picture you can see some trim that is painted, and it looks great! I’m with the majority it sounds like! Paint the shelves white and the beadboard a darker color. Tres chic. I would definitely paint the interior of the hutch a dark charcoal (like the birds in the wallpaper) so that your white objects really stand out. I’d paint the shelves and also the beadboard, if you don’t want white go with a darker color, maybe gray, or pull a color from your wallpaper. I would do the shelves white and paint the back a color taken from the wallpaper. I say paint the shelves white. It’ll help them pop against the natural wood backing. I think you should paint the back a charcoal gray to bring out the color in the wallpaper. I would keep the shelving white. Otherwise, I think it looks odd and unfinished. definitely paint the shelves white. I would do black or dark blue for contrast, especially since you have so many white accessories. I would paint them white. I vote to paint the shelves white! I also think it would look lovely to paint the beadboard backing a coordinating color from the wallpaper (like a dark grey) to make the dishes & stuff on the shelves really pop. I would paint them white and paint the beadboard a different colour. I don’t like the look of the wood now that nothing else in the room is the same. I think you should go WHITE! It does look like you forgot about them now. I would also paint or put wallpaper on the beadboard backing and this way you could make it pop even more. I like the shelves painted white. If it were my hutch I would paint the back bead board something contrasting to make your white accessories POP, like the black from the wallpaper. I’m with everyone else–white shelves will make the effect look more finished (especially since the bottom one already is, and make the paneling in back stand out all that much more. Are the shelves removable/adjustable? Glass ones would look great too! I think the shelves AND paneling should be panted – a contrast color, since the white-on-white will make everything hard to see. I would paint the shelves white and I agree with some of the others that the beadboard could maybe be painted a color. all white! it looks so great. crisp, fresh, and clean, like the rest of your house. love it! What about Black? Black background with white shelves or white background with black shelves. I vote for the white on the shelves, especially since it looks like the bottom shelf is already painted. Looks great!!!!! White shelves and something striking for the back of the hutch… is that black/gray in the wallpaper? Perhaps jet black or a dark gray. Your white collection will look stunning! I’d definitely go for the white, but I’m not so sure I’d leave the backing. I would pull an accent color from the wallpaper and paint the beadboard. But I’m sure whatever you do, it will be lovely! I would paint the shelves as I agree with an earlier comment they look unfinshed at the moment. I would definitely agree with you though about not painting the beadboard white – your lovely collection of white ceramics would be lost in the background. I would paint the shelves white, and the back a colour from the wallpaper to make the items “pop”. They would stand out against a coloured back ground, but against a white back ground, the details may get lost. I agree! White shelves and paint the beadboard a color from your wallpaper. It is looking great! Way to go Mama! Definitely paint the shelves. I like the look of the wood but you may eventually want to paint a dark accent color back there. Keep on going! It’s going to be great when it’s done. Would love to see that wallpaper in person. Bet it’s even more stunning! white!! Looks great so far. white shelves, black or dark grey for the beadboard. or DARK PINK!!!! !